Description: A touch of warm opulence is blended with elegant scroll-like styling. 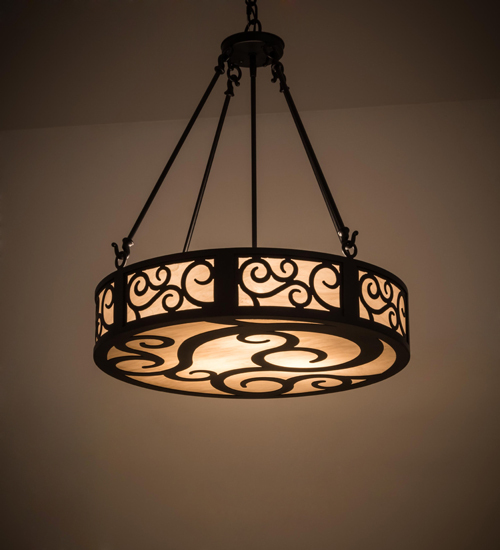 This pendant offers a lovely transitional style, which is handcrafted with decorative accents and hardware featured in a stunning Textural Black finish. The Dean fixture highlights a Fleshtone Idalight diffuser, which evokes beautiful ambient illumination. Custom crafted in the USA, this fixture is available in custom sizes, styles, colors and dimmable energy efficient lamping such as LED. The 24-inch wide pendant is UL and cUL listed for damp and dry locations.